Gold has been the main currency in the world for as far as we can remember. If you have gold you’re a rich man, so it’s no wonder why so many legends were told over the years for cities full of gold or caves nesting treasures beyond imagination. Many brave and daring adventurists have gone on quests to find hidden treasures and many simply started mining for gold over the land. But one small percentage of people who had knowledge of chemistry and the basic elements during medieval ages, began experimenting with methods that would turn plain metals like copper, led and steel into the yellow shinning gold which is so highly valued. These were the world’s first alchemist but so far there is no information that any of them has actually succeeded. 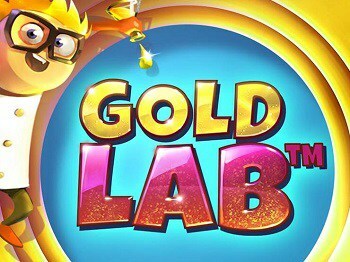 Gold Lab follows this theme, but the game play is set in modern age where a scientist operates a well equipped laboratory and actually has managed to find a way to make gold out of different chemicals. The game play in Gold Lab is fast and amusing so you can easily spend hours and hours searching for the ultimate payout to land on the reels. Gold Lab is the latest video slot game coming from Quickspin. This is already a well known company in the online gambling industry, even though they have a very modest offer of video slot games. Some of their most famous slots are Big Bad Wolf, Razortooth and the latest Spinions. Gold Lab will definitely attract a lot of attention as it has the standard design and extra wilds that is slowly becoming a trademark for the new Quickspin video slot releases. Gold Lab follows the standard Quickspin design and has 25 active pay lines which go over 3 rows and 5 reels in total. As in many other Quickspin slots the number of pay lines doesn’t correspond with the minimum bet level so players can bet as low as $0.10 or as high as $100 per spin. Beside the standard Spin button players can also use the Auto Spin button for longer session on Gold Lab. Everything in Gold Lab revolves around extra wilds, re-spins and reels covered in gold. The entire game play is very cleverly designed by using low paying beaker symbols and high paying gemstone symbols, which can’t create a big payout without one another. There are 4 different scatter beaker symbols in the game in total, which are distinguished by the regular ones by a golden frame. Once one or two of them land on the reels they act as regular beaker symbols, but if 3 of them land on reels 1, 3 and 5 they trigger the Golden Bonus feature. In this feature the player is awarded with only 4 free spins, but there is a chance to get additional re-spins so the total free spins number is actually much higher. Each time one of the four scatter beaker symbols lands on the reels, it unlocks the corresponding beaker wild symbol and turns all corresponding beaker symbols on the reels to wilds. One re-spin is awarded where you can land each of the other 3 scatter beaker symbols, which will unlock the corresponding beaker wild and also award extra wilds on the reels. This way all four of the beaker scatter symbols can turn to extra wilds till the bonus feature ends, leaving a big payout on your balance. Gold Lab is a mid variance video slot game, which has low paying symbols in general. Base play wins are small to medium, while the bonus rounds usually award up to 50 x total bet payouts. Still with the right set of high paying symbols and extra wilds in the bonus round, players can win up to 413 x total bet in a single spin. Gold Lab is an attractive video slot game by Quickspin, which is sure to have you entertained for long sessions of play. The animations and symbols are very good and interesting, while the bonus feature can be very rewarding. The mid variance and generally low payouts from the symbols aren’t too attractive but you can still win up to 413 x total bet in a single spin. This payout is still decent compared to some other video slot games and we are sure that Gold Lab will find a great number of followers, trying to mix up the right ingredients for the big payout in gold.